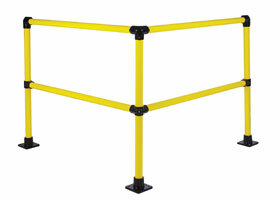 The Bumble Bee safety rail system is a highly visible, high-performance, structural fitting-based railing system designed to meet the needs of the most demanding safety rail requirements. Three standard kit configurations are available – a corner section, straight section and extension – which can be installed in approximately 15 minutes. An optional gate section is available.